Here it is! I'm so excited to finally share with you guys a big project that I've been working on over the past few months - I've developed a breakfast line for Village Market in San Francisco based off your favorite blog recipes! Village Market has been one of my favorite cafes in the city, and one that I frequent multiple times a week, so I was thrilled to go ahead and create a few healthy breakfast recipes for them! All the goodies on the menu are focused on recipes that are similar to what you see here and on Instagram - vegan, gluten-free, refined sugar-free and often raw. 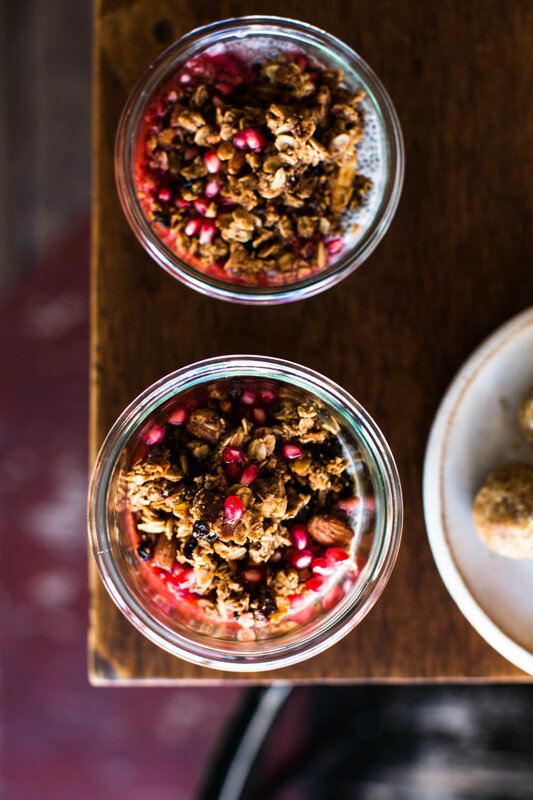 The first breakfast is a Rose Water & Strawberry Compote over Coconut Chia Pudding and topped with Citrus Granola! This is my absolute favorite flavor combination and I can't wait for you guys to try it! The citrus granola also pairs great with the Raw Ginger and Orange Zest Energy Balls that I created for the cafe! Both the Chia Pudding and Energy Balls are now available at Village Market and the recipes will change slightly as new seasonal produce rolls in. I'll also be hosting a mini launch party in the coming weeks that I'd love to invite you to! I'll keep you guys updated with that, but in the meantime, feel free to stop by Village Market for some treats! And I just wanted to say a tremendous thank you for supporting me and this blog for the past two years. This would have never been possible without you! So thank you, thank you, thank you, and I hope to run into you at the cafe! I hope you guys get a chance to stop by Village Market! I'll be there popping in and out of the cafe so hopefully I get a chance to meet you then!